This YA book kept popping up in lists of speculative or dystopian books, suggested based on other things I've read and enjoyed. I don't remember what the final article or suggestion was that made me read it, but it fits right into my personal wheelhouse: gripping, fast-paced YA; a new government system that grew out of the present in some way; and clones and the role of genetic engineering in human society. Matteo Alcaron is a clone in a world where clones have no rights. He is the clone of a drug kingpin so powerful he forged his own country called Opium. As he grows up, he meets the few other children who also inhabit this world by pure chance. Through the differences between his life and theirs, he learns more about his assigned place in the world and his understanding of his own identity evolves. Cloning and human genetic engineering makes fascinating fodder for novels exploring the future of human society. How will clones shape how humans see themselves and others? How will societal roles shift with the addition of genetically-engineered or cloned people? What does it mean to be both an individual and a clone? Like many speculative fiction novels, it's hard to discuss in too much detail without taking away the experience of discovery alongside Matteo. Through Matteo's limited view, the reader is slowly introduced to the shape of society, with clarification and new information added as Matt grows up and understands more of what occurs around him. Suffice to say, this novel does not shy away from these issues. Always the character reader, I was enthralled with the cast of supporting characters - Tam Lin, Maria, Celia, Ton Ton, and Fidelito. Matteo's interactions with these characters subtly shift as he ages and adjusts his own world view in light of new information. His relationships are not static, and that level of realism adds to the book's grit and ability to enthrall. Raul Esparza's audio narration includes different voices for the characters that help distinguish without distracting from the story as a whole. Verdict: Affirmed for fans of YA or speculative fiction generally. Audio is great, though I think there may have been a few spelling jokes I missed in listening. 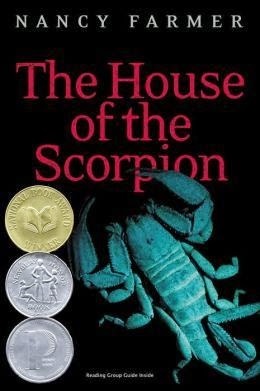 "The House of the Scorpion" by Nancy Farmer, audio narration by Raul Esparza, published by Simon & Schuster Audio on October 21, 2008. Print originally published by Atheneum Books on September 1, 2002.